TOGETHER WE CAN STOP ILLEGAL DUMPING IN NEW JERSEY! 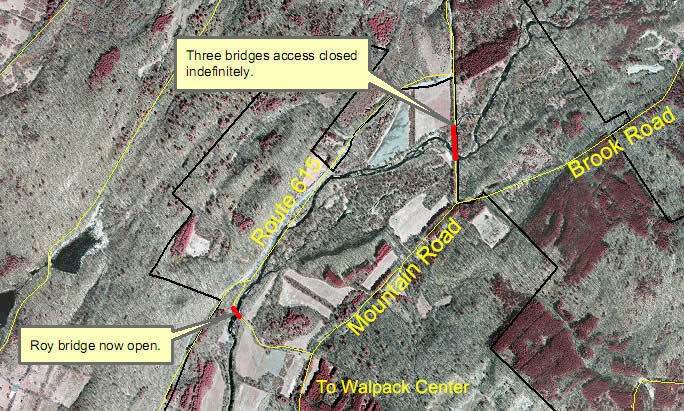 The Three Bridges area on Mountain Road within the Flatbrook-Roy Wildlife Management Area is closed to vehicular traffic indefinitely. The decision to close the road was made based on concerns from Department of Transportation engineers regarding the structural integrity of the bridges. New Jersey's Wildlife Management Area System, administered by the Division of Fish and Wildlife's Bureau of Land Management, preserves a diversity of fish and wildlife habitats from Delaware Bay coastal marshes to Kittatinny Ridge mountain tops. Ranging in size from the 0.68 acre Delaware River Fishing Access Site at the Pennsauken WMA to the 33,000-acre Peaslee Tract in Cumberland and Cape May counties, Wildlife Management Areas provide countless outdoor recreational opportunities for New Jersey residents and visitors from out of state. The system had its beginning with the purchase of the 387-acre Walpack Tract in Sussex County in 1932. This land was purchased as a "Public Shooting and Fishing Ground" by the Board of Fish and Game Commissioners, the forerunner of today's Fish and Game Council. Presently there are more than 354,000 acres in 122 areas, and new properties and additions to existing properties are continually being added. This acreage represents more than 44% of New Jersey's state-owned public open space. Initially, the purchase of lands for the Wildlife Management Area System was funded entirely from the sale of hunting and fishing licenses. In 1961, the first of several Green Acres bond issues was approved, enabling the general public to participate in the development of the system. Approximately half of the present system was purchased through the Green Acres bond issues. Operational funding is provided entirely by hunters and anglers. Capital projects such as boat ramps, dams and parking lots are usually funded through combinations of Federal Aid (funds from excise taxes on sporting equipment), Green Acres and General Fund Capital appropriations. Through the years, particularly with the infusion of Green Acres monies since 1961, the mission of the Wildlife Management Area System gradually broadened from "Public Shooting and Fishing Grounds" to areas where fish and wildlife habitat is protected and enhanced, while providing a variety of compatible recreational and educational opportunities. The number of people in search of wildlife-oriented recreational opportunities has grown significantly in the last 40 years as shown by the National Survey of Fishing, Hunting and Wildlife-Associated Recreation, conducted every five years by the US Fish and Wildlife Service. In New Jersey, the 2011 National Survey found that 794,000 people hunted fished, and more than 2,400,000 people participated in other wildlife-oriented recreational activities (bird feeding, wildlife observation, photography, etc.). The survey includes only people 16 years of age and older. While demand continues to be strong, the overall amount of land available for the pursuit of wildlife-oriented recreation is declining. New Jersey loses roughly 45-sq. mi. of wildlife habitat to development every year. In view of this reality, acquiring and managing Wildlife Management Areas is an important part of management programs conducted by the Division to provide for the public's wildlife-related recreation. Please note that state WMAs and facilities are "carry in - carry out" and trash/recycling receptacles are not provided; please plan accordingly to not leave any trash or recyclables behind. Current topographic maps of WMAs in PDF format are available on the Table of Wildlife Management Areas page; maps showing area roads are available on the Wildlife Management Area Road Maps page. If you'd like a higher resolution map or other information, please contact the Bureau of Land Management at 609-984-0547, e-mail WMAMAPS@dep.state.nj.us or write NJ Div. Fish and Wildlife, WMA Map Request, Mail Code 501-03, PO Box 420, Trenton, NJ 08625-0420.